To choose a suitable Apple varieties is half the battle. The rest depends on proper planting and care. When you consider all the factors, then after a few years you can get a wonderful crop of excellent fruit. Winter in Moscow — a harsh and summers are often issued hot, so the first thing to consider when selecting Apple varieties for planting in the area is its hardiness. Among the cultivars that can be successfully grown in this region, you can provide Apple with excellent taste "Antonivka Portovaya" and "Antonovka gold". This is a variety of old and beloved varieties. They are for the summer, that is a crop give some of the first, in July one can enjoy the first fragrant fruit with a sweet and sour taste. Among the summer varieties of apples, which are also frost-resistant, you can select "Cypress", this variety is considered one of the best and earliest (the apples ripen in late July). Besides, Apple is very decorative and can not only to please the beautiful and delicious fruit with a distinctive spicy aroma, but also beautify the area. Fans of sweet apples will appeal to the sort of "Lungwort". The fruit is large, weighing up to 100 g. Ripen in early August. The taste of apples by honey-sweet, and the flesh is juicy and flavorful. The main advantage of the class. along with its hardiness, resistance to rot and scab. 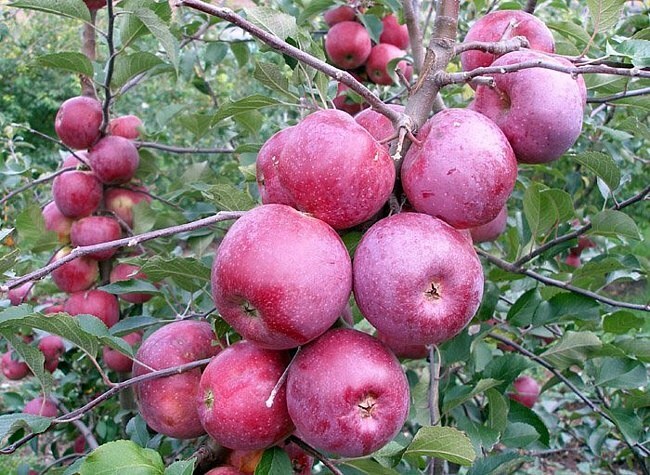 The best autumn varieties of Apple trees are considered "blueberry", "Zhiguli", "Anis al", "Darling". The fruits ripen in September and can be stored until January. Apple varieties of "blueberry" is a small and very beautiful. They have a spreading weeping crown shape. Fruit of medium size, but have a very delicate sour-sweet taste. Lack of variety in that under adverse conditions, for example, in the rainy season, they are susceptible to scab. The fruit of Apple cultivars "the Zhiguli" - large, their weight is 200 g. the Flesh is cream-colored with excellent sour-sweet taste. The variety is high-yielding enough, begins to bear fruit in the fifth year after planting, gives a steady annual harvest of apples. "Anis" - is an ancient variety that was grown in suburban gardens, along with "Antonovka". At present, displayed a few of his types. "Anisa al" attractive rosy fruit. Yakot white, sometimes with a slight greenish tint, has a rich and pleasant sour taste. The fruits ripen in September and can be stored for 3-4 months. Apple varieties "the one" was received in 50-ies of the last century, but were released only in 1999. The tree is hardy, medium size, has a beautiful spreading crown. The fruit flesh is juicy, fine-grained, great sour taste. To bear fruit the plant begins rather late, only at the 6th or 7th year after planting, but yields stable and happy harvest. When landing on the site of the winter varieties of apples you will get the opportunity to enjoy delicious fruits throughout the year until the next harvest. Maturity occurs at the end of October, but since at this time are frozen, you can remove them a couple of weeks early and put on the ripening. The best winter Apple varieties for cultivation in the suburbs are considered "Winter beauty", "Alesya", "Beauty of Moscow", "winter Bees", etc.